The problem with domestic violence in the Caribbean is not that it existed but that it persisted. 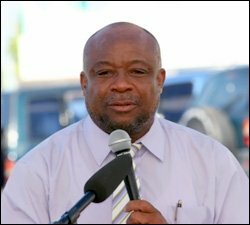 That was the view expressed by Social Development Minister in the Nevis Island Administration (NIA) Hon. Hensley Daniel while he welcomed a team of experts from the Public Affairs Unit of the United States Embassy for the Eastern Caribbean based in Barbados. Ms. Ross was accompanied by St. Kitts born Associate Director of Men Stopping Violence in Atlanta Georgia Mr. Ulester Douglas and Forensic Nurse Ms. Mary Thompson and Public Affairs Assistant â€“ Exchanges Ms. Mary E. Greaves. Also present were Head of the Social Services Department on Nevis Ms. Sandra Maynard and Counsellor Ms. Halima Gresham.